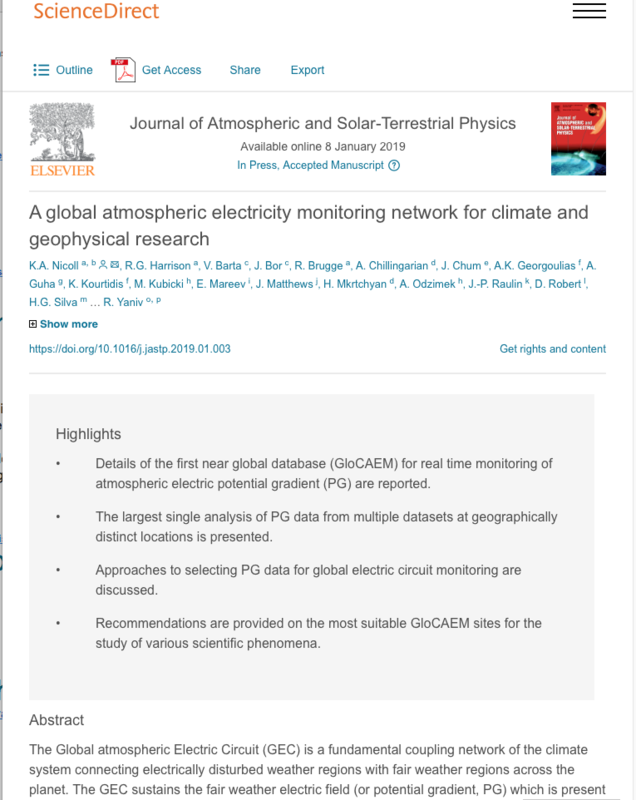 The Global atmospheric Electric Circuit (GEC) is a fundamental coupling network of the climate system connecting electrically disturbed weather regions with fair weather regions across the planet. The GEC sustains the fair weather electric field (or potential gradient, PG) which is present globally and can be measured routinely at the surface using durable instrumentation such as modern electric field mills, which are now widely deployed internationally. In contrast to lightning or magnetic fields, fair weather PG cannot be measured remotely. Despite the existence of many PG datasets (both contemporary and historical), few attempts have been made to coordinate and integrate these fragmented surface measurements within a global framework. Such a synthesis is important elvinin order to fully study major influences on the GEC such as climate variations and space weather effects, as well as more local atmospheric electrical processes such as cloud electrification, lightning initiation, and dust and aerosol charging. The GloCAEM (Global Coordination of Atmospheric Electricity Measurements) project has brought together experts in atmospheric electricity to make the first steps towards an effective global network for atmospheric electricity monitoring, which will provide data in near real time. Data from all sites are available in identically-formatted files, at both 1 s and 1 min temporal resolution, along with meteorological data (wherever available) for ease of interpretation of electrical measurements. This work describes the details of the GloCAEM database and presents what is likely to be the largest single analysis of PG data performed from multiple datasets at geographically distinct locations. Analysis of the diurnal variation in PG from all 17 GloCAEM sites demonstrates that the majority of sites show two daily maxima, characteristic of local influences on the PG, such as the sunrise effect. Data analysis methods to minimise such effects are presented and recommendations provided on the most suitable GloCAEM sites for the study of various scientific phenomena. The use of the dataset for a further understanding of the GEC is also demonstrated, in particular for more detailed characterization of day-to-day global circuit variability. Such coordinated effort enables deeper insight into PG phenomenology which goes beyond single-location PG measurements, providing a simple measurement of global thunderstorm variability on a day-to-day timescale. The creation of the GloCAEM database is likely to enable much more effective study of atmospheric electricity variables than has ever been possible before, which will improve our understanding of the role of atmospheric electricity in the complex processes underlying weather and climate.